Initiated Salmon Spawning Surveys using Aerial Photography and Skin/SCUBA Techniques on Northern California Salmon Streams. Assisted in First Instream Flow Survey on Truckee River below Derby Dam for Lahontan Cutthroat. Principal Research Investigator for First Instream Flow Survey on Tuolumne River below Hetch Hetchy Reservoir, Yosemite N.P. 1967-69. Found first native trout (confirmed by Dr. R. Behnke), in S.F. San Joaquin River, while doing fish surveys to assess Federal Power Plant (FPC) proposals. 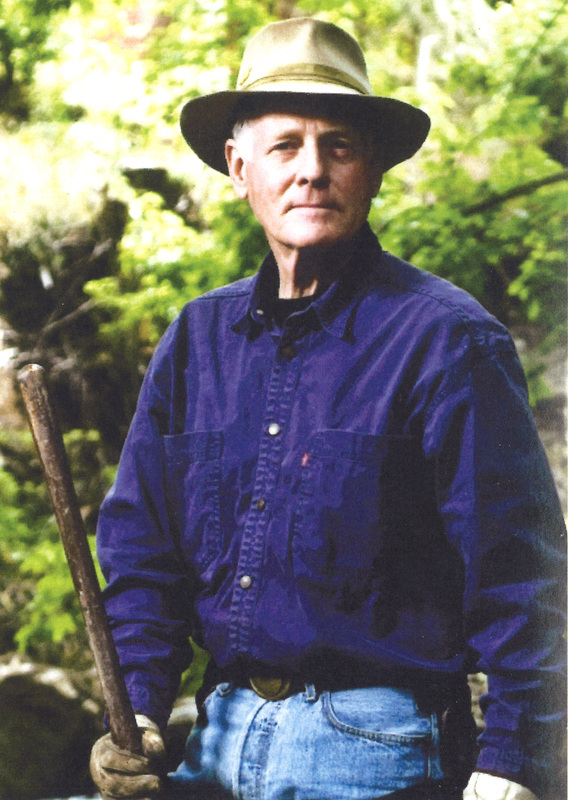 1969-1971, Wildlife & Fish Biologist, Santa Fe National Forest, New Mexico. Found several native Rio Grande Cutthroat Trout populations on the Forest, confirmed by Doc. Behnke. First in FS to use and set up lab for use of macroinvertebrates in assessing fish habitat and water quality. Organized USAF U-2 flights and imagery to assess large river aquatic and riparian habitat on Green and Colorado Rivers, spring and fall flights. Conducted and assessed first surveys of BLM’s stream inventory waters for mgmt purposes. 1974 found two populations of native Bonneville cutthroat (BCT) in Deep Creek Mtns, thought to be extinct. Planned to build two brood ponds and 3 spawning channels on Goshute Indian Reservation. Used UT DWR, US FWS, Goshutes, TU, Goshutes, Douglass Ranch to provide BCT in all Deep Creek Mtn streams, 7 West side, 7 East side, making this the First Mtn Range in Western U.S. to be completely recovered with a native cutthroat trout. 1975 found population of original native Pyramid Lake Lahontan cutthroat in Pilot Peak Range, UT/NV. Confirmed by Doc. Behnke. Assisted pilot Peak landowner and UT DWR in building 3 brood ponds for Lahontan cutthroat; got several large TU EAS grants for mgmt of species. Assisted USFWS several years in collection of eggs from brood pond for Gardnerville, NV Federal hatchery. Largest brood pond Lahontan was 17 lbs. Rewrote/Updated the Regional Fish Habitat Surveys Manual and put on FS computer system for data analysis. One First assignment was to organize a Utah Council. Assisted Paul Dremann and Bill Partner in organizing the new Council. Since its inception, I have served as Council Chair on two different occasions. 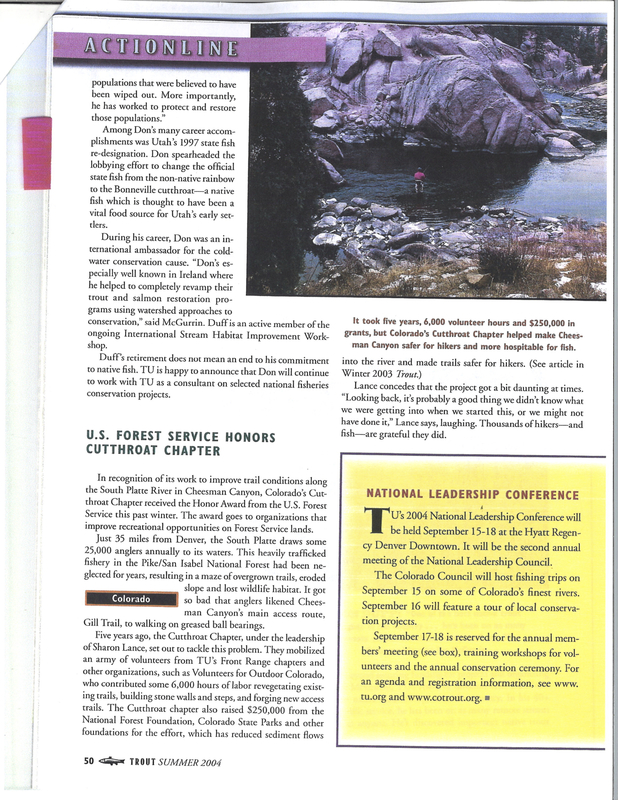 1989-1992 Developed partnership agreements across U.S. for each NF with perennial fishing waters. Covered some 96% of all waters on NFS Lands in U.S. These agreements in each State had signators of TU Council, State Wildlife Agency and FS Units. In Western U.S. also had BLM and USBR as signers. In all some 52 agreements were signed including International Agreements with TU Canada; Ireland’s Central Fish Board (CFB), Save Our Sea Trout, England’s The Wild Trout Society, and Scotland’s Tweed Foundation. Assisted Ireland’s CFB in EIS development proposal to the EU for fisheries funding. Was successful in getting $19 million pounds for Salmonid Restoration In Ireland. Was selected by Ireland to be their Technical Fisheries Consultant During the 5-6 years of funding taught Ireland’s fisheries workers to use natural Materials (wood, trees, boulders) for habitat improvements. In all we recovered 200 miles of native salmonid waters for Ireland’s native species, Sea Trout, Atlantic Salmon, and brown trout. Assisted Lreland’s Chief Fisheries Research Scientist to write a Manual for this work. I wrote the Forward to the Manual, Entitled “Channels and Challenges” by Dr. Martin O’Grady. I also served during this period as Technical Examiner with Dr. John Bracken, University College, Dublin, on 4 PhD student committees. During this period, I also went to Scotland to provide technical materials and usage for Streamside Incubators; and also went to Krakow Poland to address their Technical Institute in a lecture on streamside Incubators, which we then used in the field on the Raba River to enhance/expand their native brown trout. 1998 Formed the Great Basin Chapter, TUfor Utah’s West Desert and Nevada’s East Desert counties. Currently serving as President of Chapter, Baker, NV. Still doing native trout work for the BCT and LCT on West Desert Stream. Teach fly-fishing techniques to guests at the local Hidden Canyon Guest Ranch as well as teach women from 9 to 90 years in classes the Chapter organizes with Fly Rods from LL Bean donation. With TU EAS funding we have built a BCT brood pond and 200-foot spawning channel. Guests and women classes are taught catch and release on native BCT. 2004- U.S. House of Representatives, Recognition of Significant Contributions in USAF Remote Sensing during the Cuba Missile Crisis, 1962. 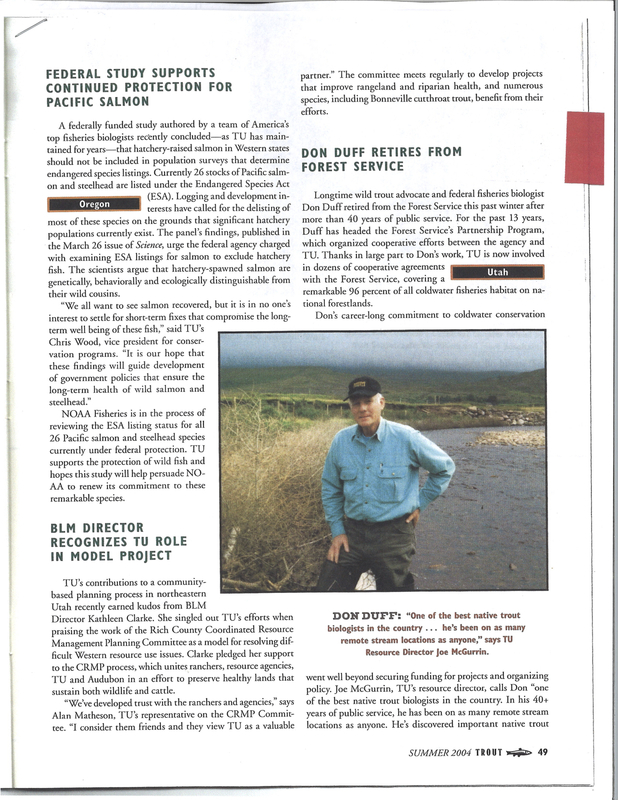 2004- Career Conservation Achievement Award, Bonneville Chapter AFS for Career Achievements in Fish Mgmt in Utah. Duff Retires January 2004, with 43 years Government Service. 2009- “One of the 50”, TROUT, Summer 2009, Duff selected as on of 10 most important volunteers for Coldwater Conservation in TU’s First 50 years.